The LCDVF 3/2 Digital SLR ViewFinder from LCD Viewfinder is a loupe that mounts around the LCD display of your Canon EOS Rebel T2i (aka 550D or Kiss X4), allowing it to be used as an LCD viewfinder with 200% (2x) magnification. By using the LCDVF 3/2 while in the camera's video mode, you can achieve more accurate focus and increase stability of handheld shooting. The LCDVF 3/2 can also be used by still photographers who either want to block out light while shooting in Live View mode or to inspect pictures on the LCD display. The viewfinder has a magnetic mounting interface which allows rapid mounting and demounting without any wear and tear. There are 4 small magnets embedded in the plastic skirt of the LCDVF 3/2 which will not damage your camera. Note: As the mounting interface uses small magnets please see the elementary precautions listed in the user manual. Do not leave the LCDVF mounted on your camera for extensive periods (for days or weeks). The use of a screen protector in between the mounting frame and your camera is not recommended. Actual dimensions are not specified by manufacturer. Box Dimensions (LxWxH) 7.5 x 4.5 x 3.4"
LCDVF 3/2 LCD ViewFinder is rated 4.2 out of 5 by 73. Rated 5 out of 5 by Flyingski from Great accessory The LCDVF has been extensively reviewed and most people find it to be well made, easy to attach, and quite useful. It usually gets dinged for not having an adjustable diopter and that was my greatest concern. How bad can your eyes be and still allow use of the LCDVF? In real-world terms, without glasses I can read a newspaper at full arm's length, in bright light only with great difficulty yet I can use the LCDVF quite easily. If your eyes are worse than mine the eye cup is large enough to allow the use of glasses so I'd say the lack of an adjustable diopter is of no concern. The increased stability it affords the user may be one of the greatest positives. Rated 5 out of 5 by Bluestockings from Very helpful I bought the Zacuto Z-finder for my Canon 7D before there were a lot of choices on the market for LCD viewfinders. Although it did help with camera shake, it almost magnified the image too much and I found myself not using it that much because it is somewhat big and heavy. I needed a viewfinder for my t2i and after reading some reviews, chose the LCDVF. I have to say I like it better. It's faster and easier to snap on the camera, it's not as heavy and it's easier to see the LCD. It's comfortable even without the red eye pad that is included. I don't need the diopter that comes with the Zacuto because I wear contacts so I'm very happy with the LCDVF. * I use it with a GGS LCD screen protector and it works very well. Rated 4 out of 5 by Anonymous from Good Product, Solid quality I use the LCDVF mostly during wedding shoots and gallery openings when shooting on my T2i+50 f/1.4 without the IS. It serves as a natural stabilizer in crowded situations when a handheld rig is inconvenient. Two things that I've learned after using it is that You have to learn to open both eyes while shooting so you don't run into people around you while looking at the LCD, and the other is that the viewfinder sometimes fogs up. Other than that I think it helps greatly with focusing and correct exposure. Would recommend. Rated 4 out of 5 by Anonymous from awesome! if you're filming in bright/outdoor conditions, this is an absolute must-have. works like a charm... fits on my t2i perfectly. it stays on great, but i always wear it around my neck as a precaution. very easy to use and comfortable to boot. the only downside is, it feels cheap... it's plastic, and i could see it breaking easily if not handled correctly. $seems like a steep price for what it is, but considering the alternative ($300+ for a z-finder), it's a bargain.from what i hear, it is also safer than the z-finder... some magnifying eye pieces can permanently damage your lcd screen if the sun's rays find their way in at just the right angle. i've read that it is unlikely to happen with this particular model. Rated 5 out of 5 by Marchuleta Productions from Essential for shooting video This viewfinder is really easy to install on the Canon EOS Rebel T2i. This device enlargers the LCD screen on the T2i making it SO much easier to pull focus when shooting video. If your using your T2i to shoot video this is a must have product. It also provides stabalization when shooting hand held. Great product all around. Rated 4 out of 5 by DanielWpg from Great Viewfinder! Exactly As Expected! Attached to my CanonT2i beautifully. I can definitely feel the added stability it adds to my video and it is very comfortable against my eye. I ordered the Bluestar eyepad (Size Small) separately believing that I wasn't receiving one with the LCDVF package, but I was surprised to find a Red Microfiber eye cushion in my LCDVF box! BONUS! Obviously can't guarantee you will receive one with yours, but maybe order the eye cushion after finding out you didn't get one. 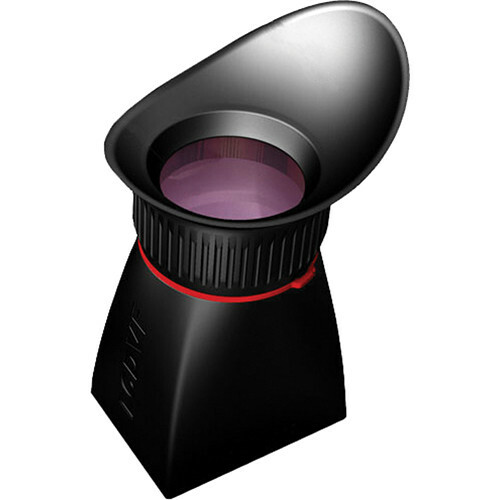 GREAT VIEWFINDER as an alternative to the much more expensive Zacuto option. Save the money on this VF and purchase a Rode videomic and a monopod of your choice and you've got an amazing video rig setup to get started with! Next stop for me... New lenses! Rated 5 out of 5 by Tim, the web video guy. from LCDVF solves the problem. The key drawback to the T2i, D5 and D7 HDSLR for video outdoors is not being able to use a viewfinder in sunlight. The LCDVF solves the problem, as promised. I purchased the real LCDVF from ... because I will not support knock-off copies, legal or otherwise from unknown sources. Will this product work on the Canon 6D? Yes, the Kinotehnik LCDVF 3/2 LCD ViewFinder is compatible for use with the Canon EOS 6D DSLR camera.